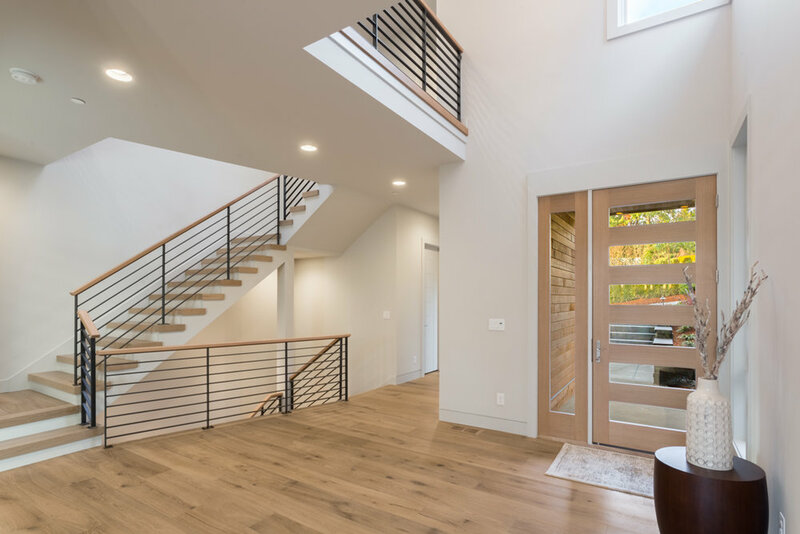 A dramatic two-story vaulted foyer and custom steel staircase sets the tone as you enter this Northwest Modern masterpiece. Exceptional flow connects dining and great room, both flooded with light from custom Architect Series Pella windows overlooking a private greenbelt and expansive ironwood entertaining deck just beyond the panes. The chef’s kitchen features Wolf and Subzero appliances and custom rift-oak cabinetry. Top floor boasts 3 bedrooms, large utility room and private master retreat with vaulted ceilings, contemporary fireplace and a well-appointed bath featuring Victorian Albert freestanding tub, custom vanities, and walk in California closet. Spacious lower level media room with wet bar, custom wine cellar with glass wall, a fifth bedroom + bath. Formal den, oversized storage, e-space, well-appointed mudroom and 3 car garage complete this one of a kind design that is The Meydenbauer plan.